While the emphasis of improved personalization and the use of innovation in the inbox makes this an exciting time to be an email marketer, it can also seem overwhelming. Many marketers want to improve their marketing emails but believe it’s just too complicated to incorporate some of the new techniques they’ve heard about. 1. Reel them in with unexpected subject lines. You can stand out in the inbox right away by incorporating something unexpected. Add a twist, like a fun icon or emoji to your subject line. We’ve even seen a few subject lines with an exclamation mark at the beginning instead of the end to grab the reader’s attention. 2. Mix in your secret ingredient: Templates. Using templates for your emails is like finding out that the secret ingredient in your grandmother’s famous apple pie recipe is store-bought crust. It’s still your favorite dessert, but it saves a ton of time behind the scenes. If you have a standard template, it's much simpler to personalize. Don’t worry: It’s unlikely that your subscribers will notice that you use the same template every time. What they will notice is content tailored to their interests. Images are especially easy to change in a template. Your hero image talks to a basic message that you know about the customer. For example, you can easily swap the image depending on whether the reader is a Millennial or a Baby Boomer. Collecting a subscriber’s birth date and year to support this should be at the top of your list. Doing so will also help you send personalized birthday offers when the time comes. Choosing more relevant images allows you to subconsciously drive a response, as recipients relate to visual cues. You’ve definitely seen it in your inbox: the countdown clock. This is just one of many ways to use adaptive content. I mentioned using location data in subject lines, but adaptive content is where this information can really shine. Incorporate personalization features based on the location where readers open your email. For example, show store locations in their hometown, but show store locations in Chicago if they reopen the email while traveling. Personalized images are another way to grab a reader’s attention with adaptive content. 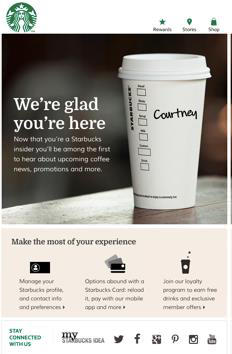 In this Starbucks welcome email, they observed a lift in click-through rates by incorporating image personalization. These intriguing and seemingly complex capabilities aren't that difficult because the technology has become so easy to use. 4. 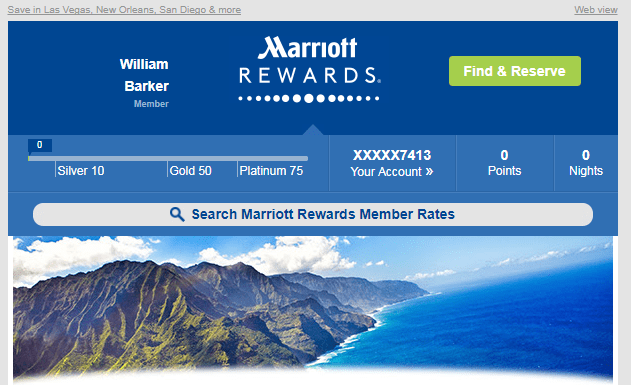 Communicate loyalty program reward status. Email is a great way to communicate other areas of your business. 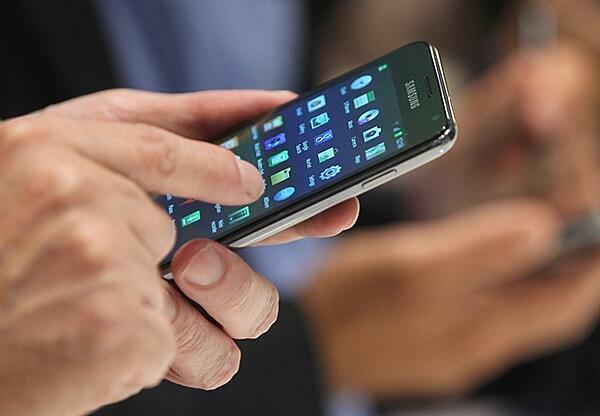 It helps the line of communication between programs and creates a more holistic experience. 5. Ask the people what they want… and think and feel. This tactic isn’t something we see a lot, but can be so effective. Content like those silly (but addictive) Buzzfeed quizzes really get people engaged. This example from a Yard House email has readers weigh in on their favorite summer cocktail. Take this tactic a step further by making the content adaptive. Involve consumers in the decision-making about your brand: What color socks should we make? What special dish should our restaurant make next month? Getting customers’ input allows you to make them feel like part of your brand. 6. Give your subscribers the time of day. Sending an email at the time when people are most likely to open or click is bound to generate lift. The right Email Service Provider can help you find the ideal deployment time for a consumer based on their individual email activity over time, and execute it with just a click of a button. Scheduling intelligence is yet another way to personalize the marketing message by deploying at a time tailored for the individual. Often times, the email you developed looks great on desktop but your readers struggle to scroll through on their much smaller mobile app. The concept of responsive design makes sure that your email is designed to render well on any device, window or screen size. If you don’t have the resources to develop responsive designs, think simple designs. To stay safe, stick to designs that are around 400-450 pixels. Make sure that your CTAs are thumb-friendly so it’s accessible for users. If CTA is to call a phone number, ensure the click is deep-linked straight to dial. Email has a higher ROI than most other channels, and it’s getting easier than ever before to deliver emails that are relevant and interesting. By adding a few tricks to your repertoire, you can show your customers that you truly know them and are working to enhance their customer experience.